With the 2011 English cricket season upon us, and an exciting World Cup to reflect upon, Kevin O’Brien’s record-shattering 50-ball century, for Ireland against a bemused England attack, served as a tasty reminder of the excitement provided by the Walter Lawrence Trophy! Now in its 77th year, the Trophy, awarded for the fastest hundred of the season, is open to all domestic county competitions, including the Clydesdale Bank 40 and Friends Life t20 limited-over games, as well as One-Day Internationals and Twenty20 Internationals, all eligible alongside those scored in the County Championship and Test Matches in England. 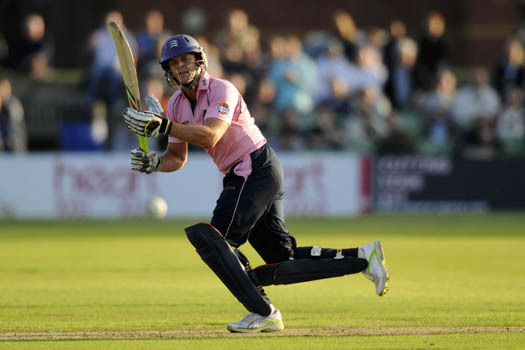 Adam Gilchrist, Middlesex’s star signing for last summer’s Twenty20 campaign, was the 2010 winner of the Trophy, with a blistering 47-ball century, which included 9 fours and 7 sixes, in the Friends Provident T20 victory over Kent, at Canterbury, on June 11. So, who will win the coveted award this summer? With the arrival of touring sides India and Sri Lanka, the flashing blades of big-hitters like Virender Sehwag, Yuvraj Singh and MS Dhoni, along with new imports like Pakistan’s Shahid Afridi at Hampshire, should add plenty of spice to an enthralling season, which concludes with the Clydesdale Bank 40 Final at Lord’s on Saturday, September 17. The fastest hundred so far this season was scored by Derbyshire’s Greg Smith off 104 balls. The 27-year-old South African-born batsman’s century included 16 fours in the LV County Championship 2nd Division match against Gloucestershire at Bristol on April 10. Ed Young, the 21-year-old skipper of Oxford MCCU, is the early leader in the chase for this season’s Walter Lawrence Trophy award for the highest-scoring batsman from the six MCC Universities. Young made an impressive 133 off 179 balls, including 17 fours and 1 six, in the drawn match against Lancashire at The Parks on April 3. Last year’s winner was Rory Burns of Cardiff MCCU, who hit a sizzling, unbeaten 230 against Oxford MCCU at The Parks on April 27: the highest score in an innings played against one of the other five MCCUs or one of the first-class counties.